One man is buried alive. Another is slain by inexplicable means. That is only the start of the mayhem that leads from the Everglades to Florida's Ten Thousand Islands and a grisly finale. 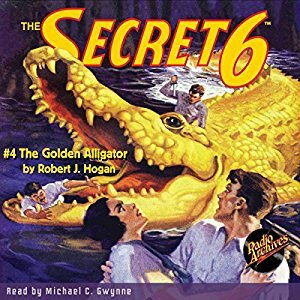 In theIr weirdest case to date, The Secret 6 confront the puzzle of The Golden Alligator--a twenty-foot long creature under the control of a secret organization whose goal is wealth beyond imagining. Fighting alone, King, leader of the 6, battles peril after peril until he faces the jaws of the hideous monster gator whose bulletproof hide makes it invincible! Will the Secret 6 survive their greatest test? Or is this the end of Hogan's heroes? Three short stories by Robert J. Hogan writing under pen names round out this riveting eBook.